Bone broth truly is one of the greatest superfoods. 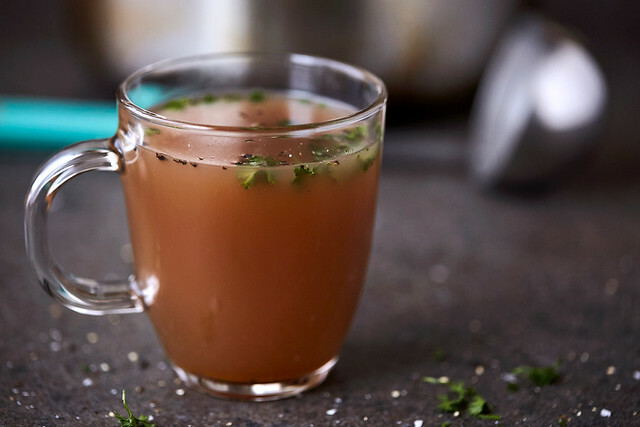 A soul-warming, healing, mineral-rich infusion found in many traditional households across many diverse cultures, bone broth is rich in amino acids and minerals and it’s healing properties run the gamut. This nutrient-dense, inexpensive magic elixir provides minerals in a highly bio-available form, meaning that the body can absorb easily them. Calcium, magnesium, phosphorus, silicon, sulphur and trace minerals. As the cartilage and tendons breaks down, you’ll also receive chondroitin sulphates and glucosamine, both sold as expensive supplements for arthritis and joint pain. The long cook time of bone broth allows the maximum release of nutrients. Bone broth contains collagen and gelatin, providing great healing value to cartilage and bones but also to the skin, digestive tract, immune system, heart and muscles. 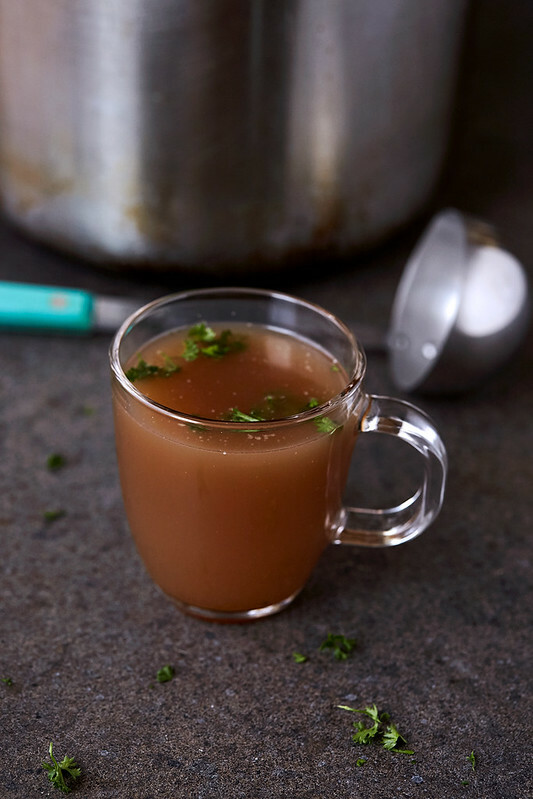 Bone broth is a liquid made by simmering bones for an extended period of time, between 4 and 24 hours. Any bones can be used: chicken, turkey, beef, lamb, pork, bison and even fish. Vegetables, herbs and spices are often added to enhance the flavor and the bones and vegetables are strained and discarded before serving. Typically, the bones will have some connective tissue, like joints and tendons, and some meat attached. Additionally bone broth and stocks is a wonderful way of letting nothing go to waste. The nose-to-tail concept of sustainability. 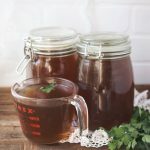 You’ve probably heard the terms Bone Broth, Broth and Stock all used fairly interchangeably, but there are actually some differences between them. Each is made using meat and/or bones, cold water, vegetables and spices / seasonings. Cooking remains similar but the time of simmering varies between them. Bone broth is different from traditional stocks and broths in that it typically is made just from the bones and whatever small amounts of meat are adhering to those bones. 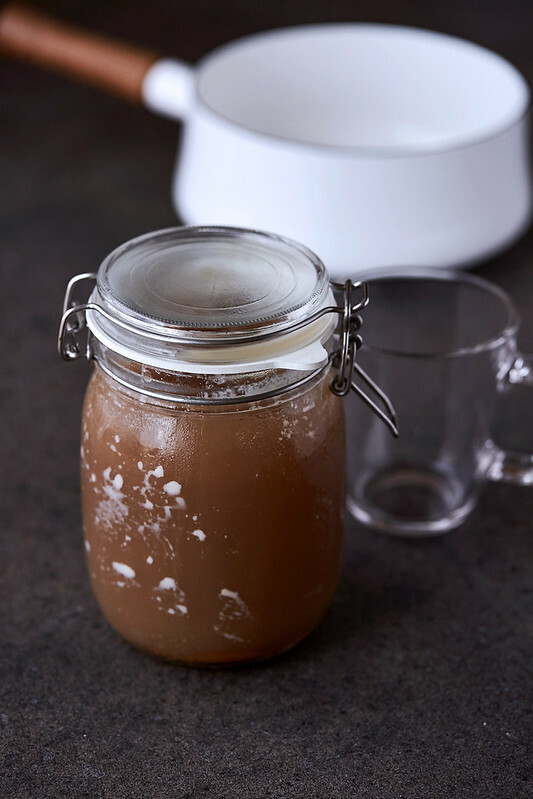 Bone broth is simmered for a very long period of time, upwards of 48 hours. Stock is made generally with bones and a small amount of meat and is simmered for much less time, just several hours, 3-4. Meat broth is generally made mostly with meat and sometimes a small amount of bones, simmering for usually under 2 hours. Meat broth and stock still have great health benefits, however it’s a lower nutrient content then long simmering bone broth. For some, bone broth vs stock also means the presence of meat and veggies vs. just bones. Bone broth usually does not contain these and stock usually does. That said, those clear definitions have definitely blurred as bone broth has become more prevalent and people find their own ways of making it, so don’t get too hung up on the words. Bone broth is rich in minerals and amino acids (the building blocks of protein used by ever single cell in our body). Two of the most abundant and important amino acids you’ll find are proline and glycine which play a very major role in healing and are two vital components of healthy connective tissue, the biological “glue” that holds our bodies together. These two amino acids are often underrepresented in our diets and while they are non-essential amino acids, meaning that our body has the ability to produce them if we don’t get enough in our diet, it is most more efficient to consume them in our food, helping ensure we get their maximum health benefits! Glycine is required for synthesis of DNA, RNA and many proteins in the body. As such, it plays extensive roles in digestive health, proper functioning of the nervous system and in wound healing. Glycine aids digestion by helping to regulate the synthesis and of bile salts and secretion of gastric acid. It is involved in detoxification and is required for production of glutathione, an important antioxidant. Glycine helps regulate blood sugar levels by controlling gluconeogenesis (the manufacture of glucose from proteins in the liver). Glycine also enhances muscle repair/growth by increasing levels of creatine and regulating Human Growth Hormone secretion from the pituitary gland. This wonderful amino acid is also critical for healthy functioning of the central nervous system. In the brain, it inhibits excitatory neurotransmitters, thus producing a calming effect. Glycine is also converted into the neurotransmitter serine, which promotes mental alertness, improves memory, boosts mood, and reduces stress. Proline has an additional role in reversing atherosclerotic deposits. It enables the blood vessel walls to release cholesterol buildups into your blood stream, decreasing the size of potential blockages in your heart and the surrounding blood vessels. Proline also helps your body break down proteins for use in creating new, healthy muscle cells. Read more about the essential roles of proline and glycine in this great post from WAPF. As your broth cools you will notice that it congeals and becomes bouncy and jiggly like jello. This is due to the presence of gelatin, a therapeutic and healing agent. Bones, connective tissue, joints and skin are all naturally rich in collagen. Through the process of simmering the broth and in the presence of heat, the collagen breaks down into gelatin. It’s the proline and glycine that we spoke about previously that form gelatin. 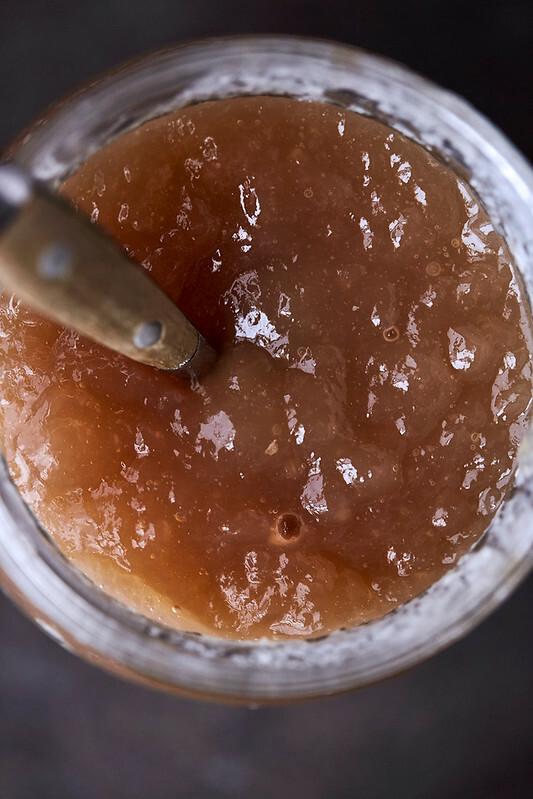 Even if your bone broth doesn’t gel, it still contains all these rich nutrients. The lack of gel can happen if there aren’t enough jointy bones or if you used too much water or if you heated on a vigorous boil for too long, which breaks it down to the individual component amino acids. You are simply looking for a subtle simmer where the top of the water is barely dancing. Again this isn’t bad, you are still receiving all of the benefits from the individual constituent amino acids, it just means that there is less actual gelatin. It’s always best to source your soup bones from grass-fed, pasture-raised animals. Ask your local farmer at your local farmers market how they raise their animals and if they carry soup bones, specifically asking about knuckle, shin, marrow, neck bones. 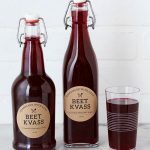 Many typically do not have these on hand, as they can take up a large amount of room and aren’t necessarily a popular farmers market item, but with notice they may be able to bring them for you in the future. You can also ask the butcher, as well be sure to have a look in the freezer at your local grocery store (usually they are tucked away, fairly hard to find in the bottom shelf of the freezer case near the meat counter). Chicken feet and necks make great additions to broth and can also be found from local farmers or with your butcher. Bones with the most connective tissue and cartilage, such as knuckles and trotters are more abundant in gelatin, providing that silky, rich texture and all the wonderful health benefits. Marrow and neck bones bring a rich, deep flavor. 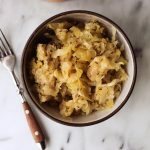 I find the combination of marrow-rich bones with jointed and meaty bones bring the most cohesive and well-rounded flavor. No Time to Make Bone Broth? If I don’t have time to make my own, Kettle & Fire is my go-to store bought, shelf stable option! 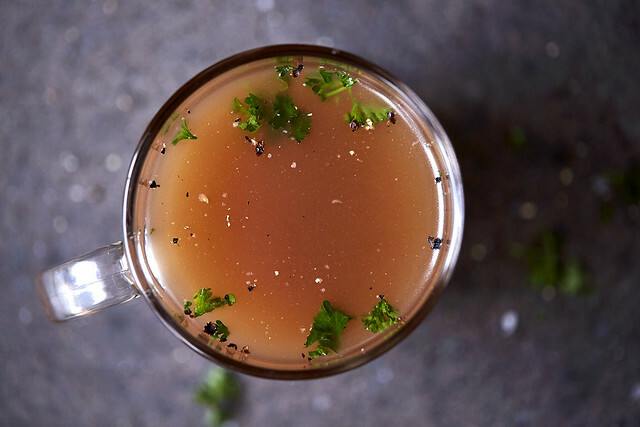 The Chicken Mushroom Bone Broth is NEXT LEVEL! Add the bones to a heavy-bottomed stockpot. Add the veggies, if using. You can also add these later in the cooking process, if you prefer. Top with cold filtered water. Cover the bones by at least a few inches. Add apple cider vinegar (or wine). This softens the bones and allows for the maximum release of trace minerals. If you’d like, season with sea salt and black pepper (adding more as it cooks or when it’s done). Bring to a boil over high heat, skim any scum off the top, if you'd like and immediately turn down to a low simmer. Cover and simmer for a minimum of 12 hours and up to 24 hours (you can actually simmer upwards of 48 hours, if you'd like). Remove the bones and strain the liquid through a fine mesh sieve. You can remove the marrow from the bones, if you'd like and spread on toast or crackers, if you enjoy that. Enjoy the broth right away or store for up to a week in the fridge or freeze in single serve cubes. Once chilled, depending on how much there is, you can remove the hardened fat and reserve it to use for cooking or discard. 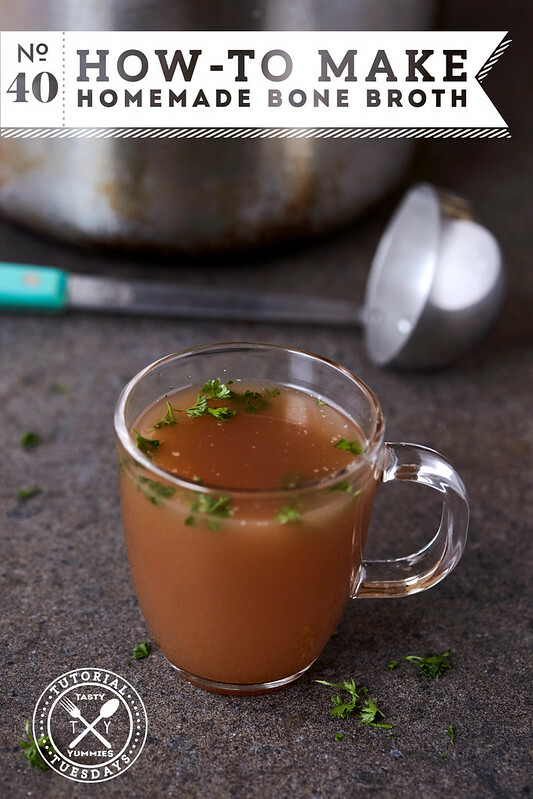 Bone broth is delicious as is, perfect for sipping, or it can be used in soups, stews, sauces and more. The water should always be cold, because slow heating helps bring out the flavors. These are not necessary to bone broth, they simply enhance the flavor. Select flavors that you like or will pair well with the final outcome of the broth, if using in a soup or other recipe. Other vegetables / flavors to consider: leeks, fennel, ginger, bay leaves, thyme, parsley, lemon grass, chili peppers, fish sauce, etc. Veggie scaps from other cooking makes a great addition to your bone broth and it’s less waste, peels from carrots, celery leaves, etc. The onion skins can be left on or added, but note, they will bring color to the soup, so keep this in mind with chicken or fish broths. If the veggies are added at the start they impart a slight sweetness to the broth, which I like. For less of that subtle sweetness, add the vegetables later in the cooking process. Vegetables that are best to avoid: broccoli, cabbage, Brussels sprouts, artichokes, green peppers, collard greens, or mustard greens, as they will make your broth bitter. Beets, turnips, rutabagas, potatoes and other root vegetables can bring intense earthy or too sweet of flavors. Start with high-quality, well-sourced bones, preferably from local pasture-raised animals. Cook exactly the same as above, for at least 8 hours and up to 18 or until the bones literally fall apart in your hands. Store in glass jars or freeze. In a pressure cooker (at least 6-quart size) and using around 3 lbs of mixed bones (still roasting ahead, to maximize their flavor), add any veggies you prefer and add enough to filtered cold water cover the bones but not more than 2/3rd the capacity of the pressure cooker or 1-inch below the max line. Add vinegar or wine, if you are using and any other seasonings or herbs. Lock the lid in place and set to high pressure for at least 75 minutes, I find the best flavor with 90-120 minutes, personally. Let the pressure release naturally, then remove the lid. When ready, remove the large bones and strain the broth through a fine mesh strainer. Pour the broth into jars and store in the fridge. Skim off any hardened fat if you’d like, once the broth has chilled overnight. I use an Instant Pot. In a 6-quart sized slow cooker/Crock Pot, dump in the vegetables (if using) and the bones (again, roasting beforehand, if you prefer, to maximize flavor). Add enough cold, filtered water to cover everything. Cook on low for 8 to 10 hours. When ready, remove the large bones and strain the broth through a fine mesh strainer. Pour the broth into jars and store in the fridge. Skim off any hardened fat if you’d like, once the broth has chilled overnight. Keep in an airtight container (I love quart-sized wide mouth glass mason jars) in the refrigerator for no more than 1 week. Store in ice cube trays (I like these large silicon trays), once fully frozen transfer to airtight freezer bags or freezer proof storage containers and store for up to 6 months. You can also store larger amounts in wide mouth mason jars, but you have to leave sufficient room for expansion, and the risk is always there, of course, for breakage. So I try to simmer my broth for as long as possible but I don’t want to leave it on while sleeping so I turn it off and then turn it back on in the morning for as long as I am home. Does the break in boiling have an effect on the broth and will it still be a bone broth if simmered for 24 hours but not consecutively? 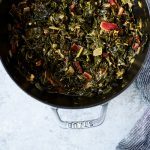 How do you adjust this recipe for using an instant pot? ?